November 17th marked the Mog's first brief foray into the swift moving Cape Fear River. The Totally Electric Powered Solar (TEPS)tm boat, driven by just one of three diminutive Torqeedo 6 horsepower electric motors, clearly demonstrated both strength and agility. Utilizing no dockside personnel for the single handed operation of the 40 foot boat would be a concern for anyone, especially departing or entering a slip in flowing water, the response and dependability of the motors was completely up to the the task. No resulting drama or bumps were encountered during all the testing. 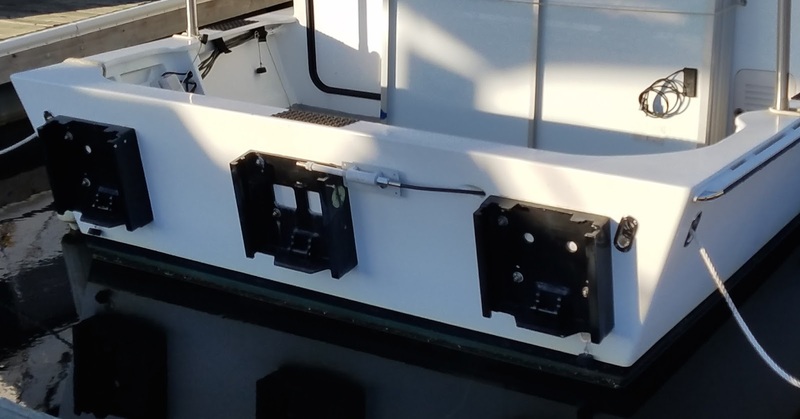 Several different combinations of the 3 motors were tested to determine how the boat could be maneuvered best while leaving the slip, located inside the marina fairway. The departure was challenged by a light wind and the river's noteworthy flow. The best method was by using the port and starboard motors to steer the boat in the close confines of the fairway's moving water. The levers of the forward/reverse controls at the helm made the task logical and most intuitive with the added convenience of displaying the electricity level (fuel) while under way. After clearing the slip and exiting the fairway, only the center motor of three was used, the port and starboard motors being switched to the off (neutral) position. The two stopped motors were left to their full immersion depth while all drive and steering was performed by the single 6 hp center motor. A 60 horsepower internal combustion engine (ICE) had previously occupied the center jack plate, now used by a Torqeedo electric motor. Although much less power by ICE standards, the new electric motor was actually an improvement in both operation and handling. The selection of the motor's drive direction at the electric motor controller (binnacle) was not the choppy response to inputs that the ICE demonstrated. Also absent with the electric motor, was the raw overspeed accompanying direction change with attendant engagement clunks in the gear box. Also of note was the lack of noise, fumes, and most appreciated, the smooth transition through forward, neutral and reverse. A longer duration full throttle test was made while out in the river. Full power was very briefly used just to get an idea of the reserve capability. As shown in a previously made video, there is no lack of drive from the 3 twelve inch high efficiency motor propellers. More tests of that sort will be performed a bit later when all the photovoltaic modules are once again returned to the roof. The recent test was made with only half the usual solar array size as evidenced by the unused modules secured to the bulkhead in the aft cockpit. Although all the drive electricity comes from the batteries, the solar array atop the roof replenishes some battery deficits during full throttle operation. 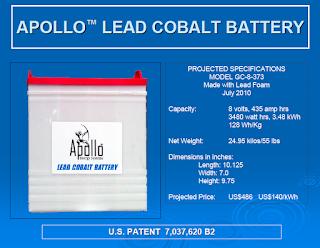 The array wattage output at this time of manufacturing is not great enough to run the boat at full throttle for extended periods but does provided the capability to bolster the battery reserve when high demand is needed. Keep in mind that a somewhat typical trawler carries about 300 gallons of diesel fuel weighing in at about 2000 pounds. The Mog has been making all of its runs on less than half that weight with just conventional lead acid batteries. at the very same weight with no complex cell balance electronics. 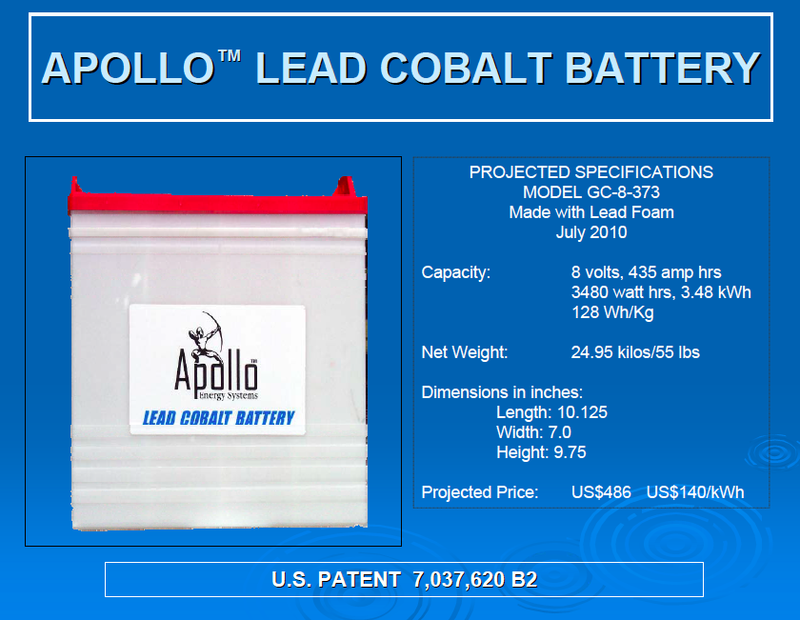 We have batteries in the near future that are safer, faster charging, as long life, quarter the cost and simpler than Li systems. We also have a new solar array a fifth the current weight with better roof conformity, more watts at a low price per watt of energy. To top those pluses, all of the system elements are quick to stow or move at the owners desire. Moreover, the systems, including drive motors, are able to be dismantled and shipped by ground or air delivery for upgrade or replacement. Try that with some of the other power devices and storage systems. This 11 module 450 pound 2.5 kW array will be replaced with 4 kW at 100 pounds. 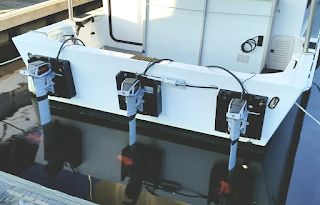 The Mog, our boat named ALGEMAC II, has a power and drive system being designed to be fixed as consumer serviceable modules with online wireless diagnostics at a factory into the boat. Now you don't. Unlock them, 15 minutes they are stowed inside. The following are short videos made by the captain during single handed sailing. More in depth videos will be upcoming after the solar roof is reassembled as used in 2016. Only one of the 3 electric motors, at about half throttle powered the boat against the tide flow with the solar array keeping the batteries at a constant 24 volt system level. The slip and fairway test was navigated by two motors with the center motor off (neutral).